Upon reading the article from one of my favorite sites, The Kitchn (yes there's no "e" on purpose), I was immediately in love...well at least definitely intrigued. In their article was one of the simplest recipes ever for Cinnamon Water. I had never heard of such a thing! It sounded so refreshing and neat and weird and interesting and "good for you" that I couldn't resist! As you know, cinnamon is an excellent spice for those needing to regulate their blood sugar (ahem diabetics??). I don't know what it is about cinnamon that helps that regulation, but it's absolutely true and always recommended to those with blood sugar problems. 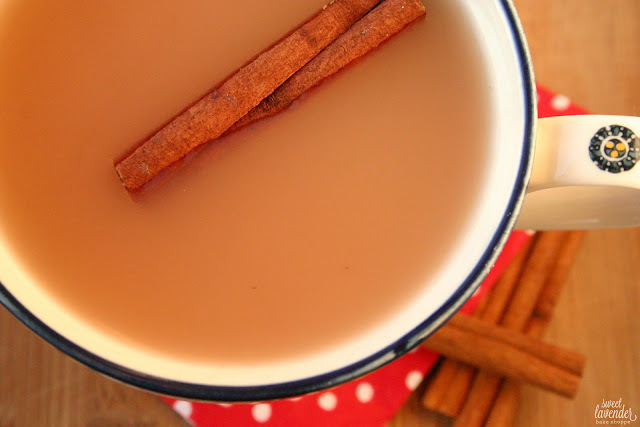 In a 2-quart sauce pot add your filtered water and cinnamon sticks. Bring to a boil. Turn down heat to medium (or until you have a steady simmer) and simmer for 10 minutes. Remove cinnamon sticks but don't discard! Save them for one more use. I was able to make this recipe twice (so 8 servings total) with my two sticks :) The second time, I simmered for 15 minutes to extract the last bit of cinnamon flavor out. 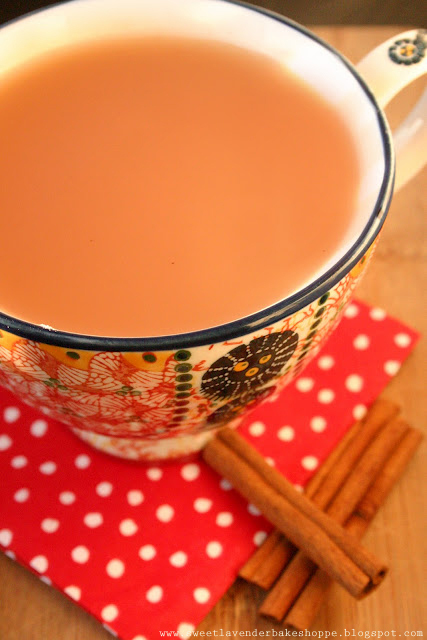 Pour hot cinnamon water carefully into 4 mugs. Mix in 1 ounce of almond milk and honey to taste. I added 2 teaspoons of honey to our mugs for a subtly sweet flavor. You are welcome to add more, less, or none at all if you're so inclined! **Making this tea will infuse your whole house with the most wonderful scent! **You want your water to turn an amber color- almost like a dark beer. **You can make this recipe, use what you want and store the rest in an air-tight container (with cinnamon sticks included) in your refrigerator. When you want more tea, simply add whole thing to pot, dilute with maybe a 1/2 cup more water and heat up! Perfect for a cold winter's night! Yum! This sounds so warm and delicious! Perfect for the winter. That sounds like the perfect way to get nice and warm from the inside out. I'm going to make myself a cup today!